This is a chart for the first plane crash of the 9-11-2001 World Trade Center attacks. The event has given our overlords in Washington a blank check to wage wars, oppress Americans, and spend billions of dollars on "homeland security" measures of varying levels of dubiousness. 9-11 has been, for over a decade, the American State's best friend. Plenty of well-known astrologers have already written about the planetary configuration for this historic date. As a result of all the discussion, the Sibley chart for the USA is now the de facto standard chart that astrologers turn to when looking for "America's chart". I'd simply like to point out that the 9-11 event matches the Bloodbath Formula which I write about on this site. When the formula appears in the sky, mass-murders are likely to occur. Mass-murdering individuals (including the current US President) tend to have the formula in their natal charts. 1. Pallas conjunct and contraparallel Pluto. Weakening Pallas' objection to violence. 2. Venus sesquiquadrate the South Node and ruled by the Sun which is sesquiquadrate Neptune. The liquefaction of the perception of value, including that of human bodies. 3. Pluto trine Venus. The destruction of value. 4. Pluto quindecile Moon and sextile Moon's ruler Mercury. 5. 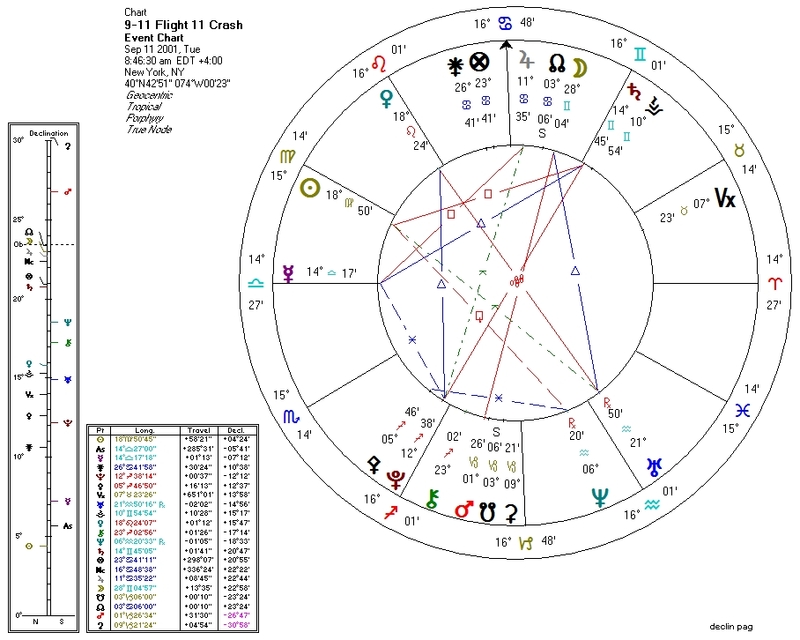 Pluto square Sun, which is ruled by Venus which is trine Pluto. The infusion of the moment with destructive force. At this moment, we are just past the Jupiter return for 9-11, which just happens to coincide with a Pallas-Pluto opposition. Many of the same themes have resurfaced: race/culture (Jupiter in Cancer), violence, and aggressive government.